Target: a resource for example a service, folder or report. Permissions: type of access for example read or write. Setting: indication of whether access is provided, for example grant or prohibit. Govern that groups access to functionality using rules. 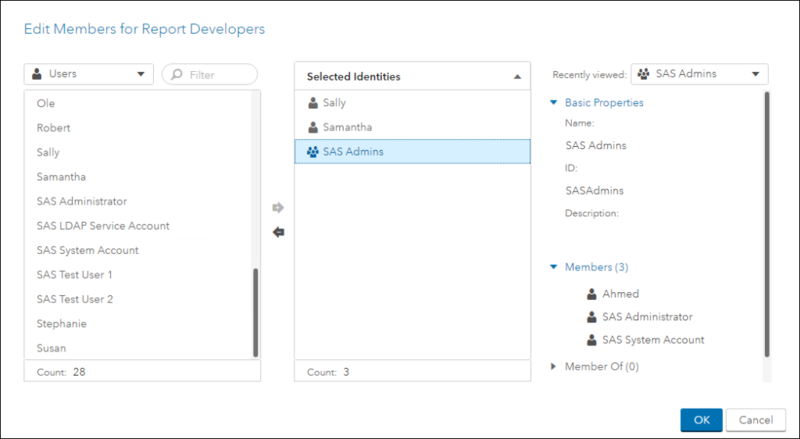 In SAS Environment Manager, as an administrator (only administrators can manage users and groups) select Users > Custom Groups > New. In the new custom group screen give the group a name, a unique id and a description. We will call our group Report Developers. After the new group is created, click the edit button to add new members to the group. You can add users or other groups as members of the new group. Now that we have a new group called Report Developers, the next step is to create or update the rule that determines who can access this functionality. First, we will look at what rules currently apply to SAS Visual Analytics. In SAS Environment Manager select the Security menu item and select the Rules view. Select Filter by: ObjectURI and enter SASVisualA in the search box. The second rule listed is the one we are interested in. Notice that URI ends with /**. URI’s can end with /* or / **. An objectUri that includes the /** suffix affects access to all descendant functionality. For example, the /SASVisualAnalytics/** means all functionality in the SAS Visual Analytics application. The rule works because the general authorization system implicitly disallows any access that is not granted. 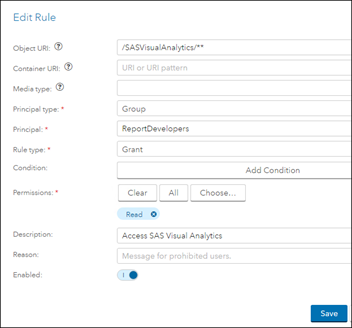 The current rule overrides the implicit deny to allow authenticated users to access SAS Visual Analytics. We will edit the rule and change the principal from Authenticated Users to ReportDevelopers. In the edit rule screen under Principal, select ReportDevelopers. 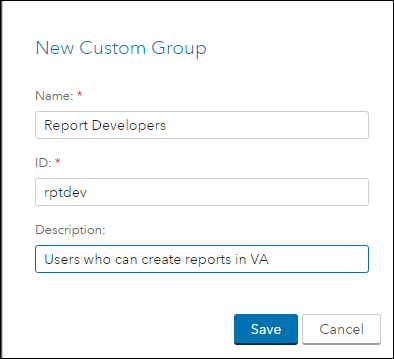 The impact of the change is that now only users who are members of the Report Developers group can access the Visual Analytics application to create reports. To test this, you can logon as a user who is not a member of the group. Those users will be able to navigate to reports and open then using the report viewer, but they will not be able to access SAS Visual Analytics to create new reports. New rules for authorization in SAS Viya was published on SAS Users.